You are here: Home / CD Releases / Editorial / feature story / Staff Year End List: Top 3 Edition! Staff Year End List: Top 3 Edition! Reviewed by admin on December 30, 2017 . Staff Year End List: Top 3 Edition! John Mayer is a musical savant. There are many musical outfits he lends his talent to, be it his writing, guitar playing, or smokey distinctive vocal styling. This was a highlight of my year after having suffered a devastating stroke in May. I, as a twenty year concert photographer, was unsure if I’d ever set foot in a photopit again and I did, for the very first time, that night this year with Mr. Mayer. It was a cathartic, healing, spiritual, and a hyper-sparked emotional show for me. If there is ever a musical miracle story to tell it is that one. #2 Colony House – Only the Lonely Staff covered them live this year when they came to town with Mutemath. #3 Cherry Glazerr – Apocalipstick Staff covered them live this year when they came to town with Foster the People. 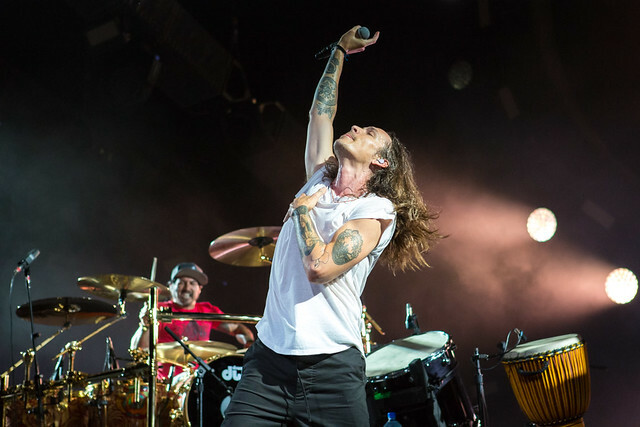 Runner up – Incubus – 8 – It was just good to see them back with a new album and tour, which we covered as well! Still the worst – Bhad Bhabie and every one of her singles. No album yet, let’s hope it stays that way! After another fall out that put Paramore’s future in jeopardy, there were several occasions where I thought to myself, “This might really be it.” It never truly seeped into my bones, being the diehard that I am, so I can’t say that I was surprised they dropped another album; more like… relieved. After Laughter is everything I love about Paramore, sans their punk roots. Lyrics that sound all too familiar (as if they came from my own secret folder of notes in my phone), a leveled up vocal style from Hayley Williams, and subtle tones of musical genius from Taylor York, After Laughter was, is, and will continue to be the soundtrack to my happiest and ugliest days. Cry hard, dance harder. Runner-up (more like, this was an EP and I wasn’t allowed to put it on the list but I still want everyone to know about it): Taylor Janzen – Fear & Faith. Wanna know why I adore this EP? Check out my interview with Taylor here! Sam Smith has done it again with the release of his second official studio album. The Thrill of it All hit stores on November 3rd, and has been certified Gold in Australia, the United Kingdom, and Canada. Smith’s unique tone and range really made the album along with the emotion that he puts into topics that everyday people go through. His voice has made break ups a little less painful, and even helped us get back on our feet afterwards. He touched on subjects like love and religion, and made us realize that no one is perfect. We can’t change the past, but we can change our futures. The album America needs to hear, but will most likely pass on for the next reality TV pop star’s next release. Despite the involvement of Good Charlotte’s Benji Madden as producer, or rather in spite of it, Anti-Flag remains the standard bearers of political punk in America. Progressive, intelligent, heartfelt, honest, and inspiring (because the majority of us agree with what Anti-Flag has to say as compared to what the Clockwork Orange in office says, and they aren’t afraid to sing about it), American Fail is filled with fast and loud guitars, drums, and bass. Forget Green Day. Forget U2. Anti-Flag is delivering the politi-punk this country needs, and, I have to believe, craves. If there’s one new artist this year I think completely took the music industry by storm and just impressed the hell out of everyone with how insanely talented she is, it’s Lindsay Ell. When Ell unleashed The Project on us, people were awe-struck. Social media lost its mind and still hasn’t fully recovered yet. Fellow artists praised Ell from the rooftops, and her own musical icons even shared the stage with her in pure admiration. I can’t think of another new artist who has had this kind of an impact on music in a long time. One thing The Project most certainly does without question is showcase Ell’s killer guitar slaying skills, something she’s already become so known for in the short time her debut album has been available. With the most honest and emotion filled lyrics, Ell’s debut album defies musical gravity, as it is 100% driven by the singer-songwriter’s relentless determination, inspiring passion and extraordinary level of creativity. Refusing to be boxed in, the Project uses its multi-genre influences of blues, rock, pop and country to produce its own unique blend of musical perfection that is a sound unlike anything else we’ve heard up to this point. Though easily comparable to her icons like John Mayer, Keith Urban, Sheryl Crow, and Bonnie Raitt, Ell’s style is all her own, and it’s heard continuously throughout The Project. Whether the Canadian native is speaking to our souls with her aching vocals that sucker punch you right in your feelings on songs like “Space,” “White Noise,” and “Criminal,” or she’s got us grooving to her stellar guitar riffs and jazzy, upbeat melodies on songs like “Mint,” “Wildfire, and “Good,” one thing you can count on when listening to The Project is hitting the repeat button every time. Lindsay Ell took every single expectation any one had of her debut album and totally shattered them all with her sheer, raw, incredible talent and passion for her craft. The Project is the album music needed this year. When considering my favorite album of 2017 I was left with only a few that I had on repeat since the release date. RTJ 3 is the one that is still on my phone today almost a year from the surprise digital release. So many things about this album are massive, from production to lyricism that ranges from silly to serious. RTJ 3 has it all. This album and the #2 listed here both evolved for me after many listens allowing me to appreciate new tracks well beyond the first listen and in today’s digital age where it’s on to the next song that means alot to me. Bleacher’s album sophomore album, Gone Now, is an innovative musical masterpiece. The album was written and produced by lead singer, Jack Antonoff, over a period of two years in his New York City apartment. Bleachers’ Gone Now is a satisfying album filled with pounding synths and catchy choruses. The band’s single “Don’t Take the Money” got popular attention from the radio this year peaking at #2 on Alternative Radio. Each piece on the album is packed with lyrics and sounds that you will have to listen to a couple times over in order to digest the entire song. Gone Now is brutally honest about love and loss and dives deep into what it’s like to be inside Jack Antonoff’s head. With tunes like “Everybody Lost Somebody”, “I Miss Those Days”, and “Dream of Mickey Mantle”, it’s hard not to love Bleachers’ passionate album, Gone Now. The orchestral arrangements perfectly complement Amy Lee’s vocals. A more subtle, dynamic, and dare I say, mature sound than we’ve heard from her in the past. One intense record. Packed with both heavy tracks as well as melodic tunes. Not many albums get released anymore that you can listen to front to back. There is something there for everyone to enjoy. Hands down best record in 2017. IMO. With the creation of “mumble rap” and the current evolution of “trap music,” it’s not hard to find a music fan lamenting over the present state of hip hop. Real fans know though, the good stuff is always readily accessible and this year, we received plenty of beloved lines to choose from. My top choice? Enter hip hop artist and activist Substantial. Best known for his work with the prolific late Japanese producer Nujabes, the great Chuck D of Public Enemy himself has touted this MD native as “one of the greats MCs of our time.” If a stamp of approval from one of hip hop greatest pioneers isn’t enough (seriously, that’s not enough?) then check out Substantial’s newest project yourself. With production from some of hip hop’s favorite producers like DC’s own Oddissee, The Other Guys and MD native JSoul, this project blends together precise lyricism with soulful beats. Tracks like “Follow The Leader” (produced by The Other Guys) stand out with its hypnotic use of horns and funk, reminiscent of early 90s classic beats. Honestly this album is pretty much golden production wise but Substantial never lets that outshine his flow. On “Tony Stanza” ft. Tonedeff and Marcus D, both emcees show ridiculous skill, switching delivery every few bars and throwing punchlines hard enough to bludgeon any doubters. I literally listen to it twice a day, to keep the wack emcees at bay! Nothing More has been pushing hard to get to this point in their careers but not without their share of adulation and awesome hard work. Getting more Grammy nominations than they know what to do with the guys in Nothing More were actually my first show that I fell in love with concert photography and are now making me fall in love with pulse pounding and adrenaline fueled rock! Nothing More is set to tour with Papa Roach in 2018 and I will be at as many shows as I can!